This means that any photo that exceeds this size in either dimension, could end-up being cropped by the projector. In other words, the image width cannot be more than 1400 pixels and the image height cannot be more than 1050 pixels. A resloution (PPI/DPI) of 72 or 100 is sufficient for the projector, but we ask that you use 300 PPI so that high scoring images can be included in our news letter, the Shutter Tripper. Open or leave your image open in Photoshop or Elements. Then go back to the top two fields of the dialog box to change the Pixel Dimensions. For a vertical image (portrait orientation), change the height field only to 1050 pixels. Again, do not change both fields. The other field will automatically adjust. For an image that is square or close to square, change the height field only to 1050 pixels. You can tell if an image is in the square category rather than horizontal, by the auto adjustment of the fields. If you change the width to 1024 and the height auto-adjusts to more than 768, then you have a square(ish) or a vertical image. 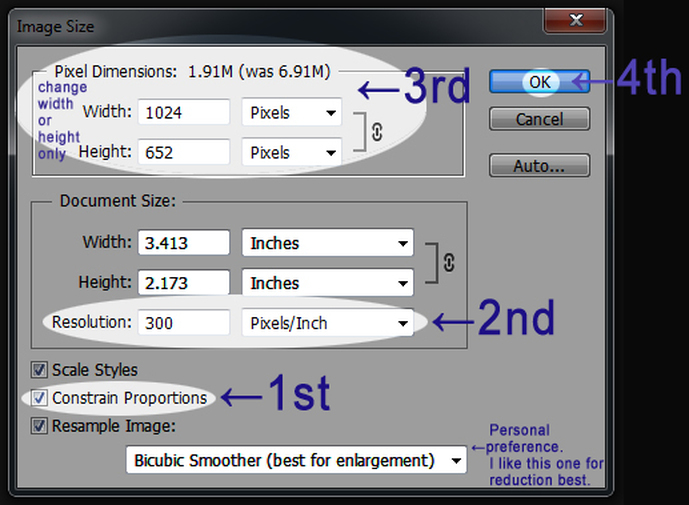 If that is the case, before clicking Okay, you can change the height field to 768 and the width field will auto adjust. 8. Use Save As to save the resized image so you do not overwrite your original full size file. The illustration above is from the Image Size pop up dialog box in Photoshop CS6. Note: Resizing will down-size the image from the native resolution coming out of your camera which also significantly reduces the file size. This helps when emailing the files and takes up less space on our hard drives. For saving your images & naming the file for competition, see the end of the Competition Page.